The KIR (Killer cell immunoglobulin-like receptor) gene cluster is a region of approximately 150 kb within the Leukocyte Receptor Complex (LRC) on human chromosome 19q13.4 (CM000681.2: 50900001-58617616). The KIR family is highly divergent, with multiple haplotypes differing in gene content, and with individual genes exhibiting allelic variation. Only a few KIR genes are conserved between humans and chimpanzees, the closest living relatives to humans. The GRCh38 assembly includes 35 representations for the LRC-KIR region as alternate loci scaffolds in addition to the chromosomal sequence (ALT_REF_LOCI in LRC-KIR region). David Roe and colleagues (personal communication) recently sequenced a diverse panel of KIR haplotypes with the goal to report novel structures and to demonstrate the ability to fully characterize KIR haplotypes, even across long repetitive sequences in diploid individuals.The sequences for these 15 haplotypes are derived from 8 individuals (one is homozygous for the haplotype). While all 15 haplotypes represent new allelic variations, 6 of the 15 haplotype structures exhibit novel numbers and types of KIR genes (rows highlighted black in Table 1). Table 1: Haplotype identifier, GenBank and RefSeq accession numbers for the 15 new KIR haplotypes reported in GRCh38.p8; rows highlighted in black indicate new haplotype structures. The haplotype name shown in Table 1 is reported in the Comment section in both GenBank and RefSeq records. 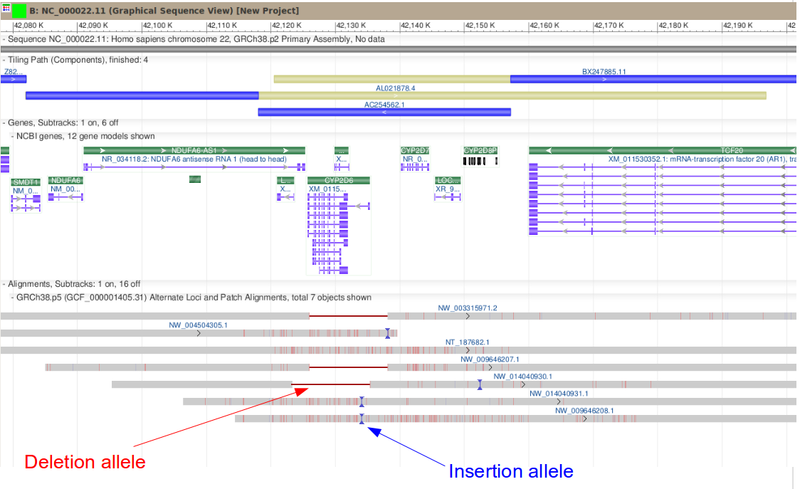 All 15 new haplotypes have been added to the reference assembly in GRCh38 patch release 8 (GRCh38.p8) as novel patches. Figure 1 provides a comparison of the KIR gene content of reference chr. 19 and the novel patch haplotype "cA04". The novel patch NW_016107311.1 represents a new KIR haplotype which contains only 4 KIR genes as compared to 9 KIR genes in the reference chr. 19. Figure 1: LRC_KIR region on chromosome 19q13.4. Top: KIR region on reference chromosome 19, the 4 genes in common between the reference chromosome and the novel patch labeled in red and the 5 genes missing in haplotype "cA04" boxed in blue. Bottom: KIR gene represntation in haplotype "cA04" (KU645198.1). This haplotype has only 4 KIR gene (labeled in red) as compared to the reference chr. 19. The blue bars represent the tiling path of chr. 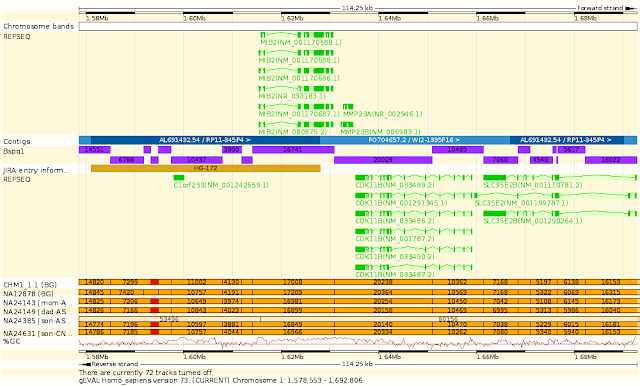 19 (NC_000019.10) and the gray bar represents novel sequences. In the gray track representing alignment of KIR haplotype to chr. 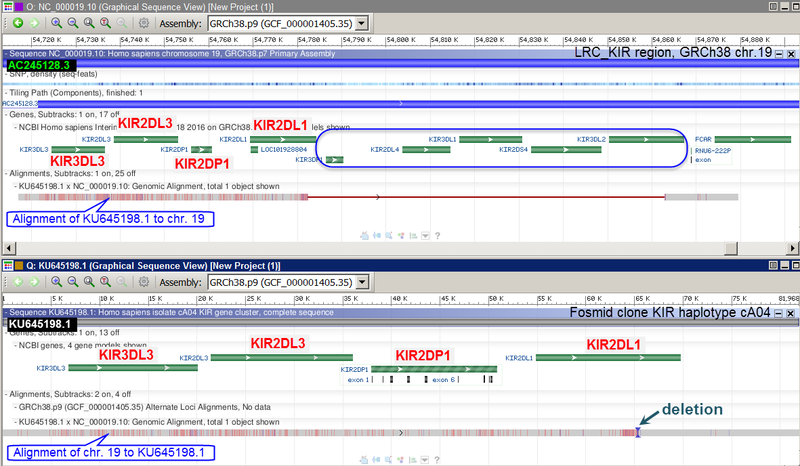 19, the solid horizontal red line indicates the region of KIR haplotype "cA04" that has no alignments to reference chromosome, the small vertical red bars indicate mismatches, and site of missing sequence in “cA04” is highlighted as deletion. The Roe group assisted the GRC with the alignments of the patch scaffolds to the reference chromosome to ensure gene relationships were properly represented. The KIR region is one of the most variable regions of the human genome. Donor selection based on KIR genotyping of multiple best matched HLA has improved transplantation outcome, and certain combinations of KIR-HLA genotypes have been reported in association with autoimmune diseases and malignancies. The newly represented KIR haplotypes provide additional resources for haplotype analysis of KIR genes. Are you familiar with CYP2D6 and its importance in drug metabolism? CYP2D6 (Gene ID: 1565) is a gene associated with the metabolism of ~25% of clinically prescribed drugs, including antidepressants, neuroleptics and opioids. CYP2D6 is located on chromosome 22 (22q13.1), near two cytochrome P450 pseudogenes CYP2D7 and CYP2D8P. Because of its functional importance, the GRC updated the chromosomal representation for CYP2D6 to the sequence-corrected clinical standard (CYP2D6*1A) in GRCh38. The version of CYP2D6 found in the prior assembly version, GRCh37, was retained in GRCh38 as an alternate loci scaffold (KI270928.1). The Genome Reference Consortium, in conjunction with the Pharmacogenomics Research Network, has also sought to identify and provide reference assembly representation for structural variation at the CYP2D6 locus. Much of this work was done by examining the end-sequence alignments of different fosmid libraries to the reference (Kidd et al.). As the reference assembly was known to represent CYP2D6, CYP2D7 and CYP2D8P each in single copy, we could ascertain potential duplication and deletion alleles of these genes by identification of discordant fosmid end-sequences (Figure 1). Figure 1. Alignment of fosmid ends from the ABC12 library to GRCh38 chr. 22 in the vicinity of CYP2D6. Lines connect ends belonging to the same clone. Concordant placements (length within 3 standard deviations of the library insert average and inward facing ends) are shown in blue; clones with discordant placements are in red. As of the GRCh38.p7 assembly release, there are 3 alt loci and 3 novel patch scaffolds that provide representation for significant structural variation in the CYP2D6 region (Table 1). 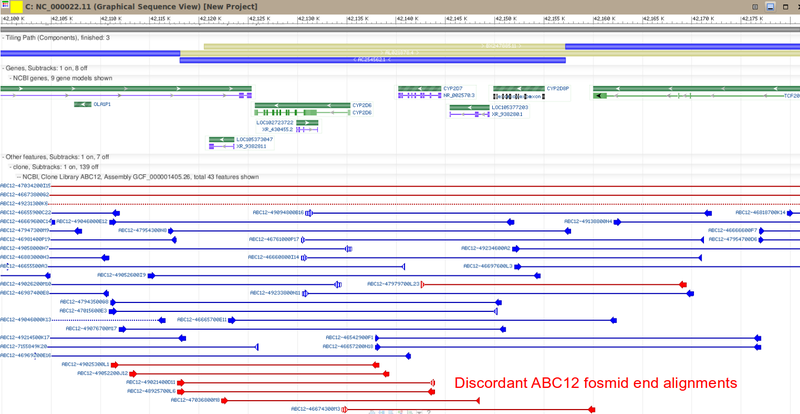 Figure 2 shows the alignment of these scaffolds to the reference chromosome, highlighting the diversity in the variant representations. An example of a CYP2D6 triplication haplotype is shown in Figure 3. Table 1: Scaffolds providing alternate sequence representations for the CYP2D6 region, as of GRCh38.p7. The inclusion of these additional representations for the locus in the reference assembly is intended to help in the evaluation of CYP2D6 variant alleles from other samples. The variant scaffolds can be included in the target assembly when using an alternate aware aligner, such as bwa-mem or SRPRISM, to align reads and should enable the identification of the haplotype that is the closest match to the query sample. Figure 2. Alignment of alt loci and patch scaffolds to the CYP2D6 region of GRCh38 chr. 22. 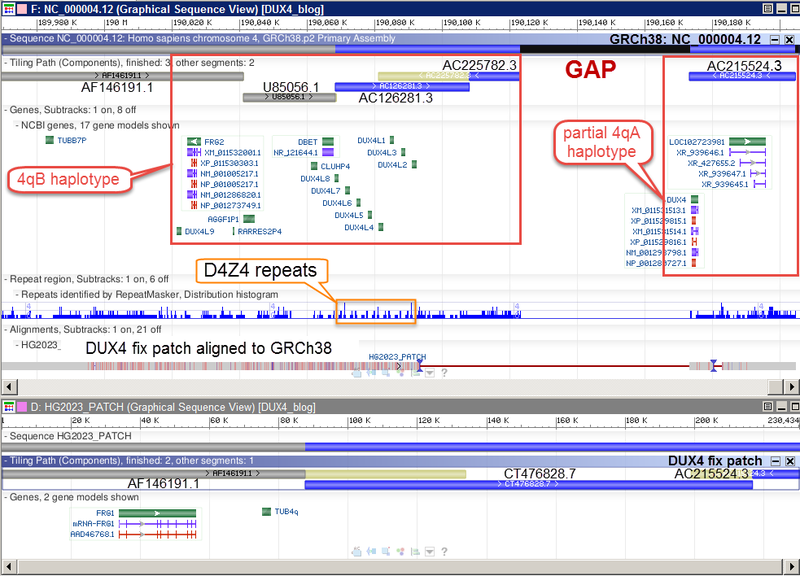 The blue bars at top represent the genomic clones comprising chr. 22. 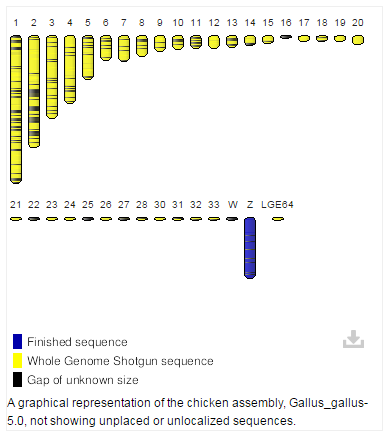 The NCBI RefSeq annotation of the chromosome is shown in the middle. The grey bars at the bottom are the alignments. Thin horizontal red lines represent deletions in the scaffolds relative to the chromosome, while vertical blue bars represent the locations of scaffold insertions. Figure 3. Graphical view of patch scaffold NW_014040931.1, with the alignment of CYP2D6, revealing a haplotype containing a triplication of this locus. ZFIN, the zebrafish model organism database, is joining the GRC and is planning to take over the maintenance and curation of the zebrafish genome assembly. ZFIN curators visited with GRC curators at the Wellcome Trust Sanger Institute in January 2016 to undergo training in the use of GRC tools and processes. ZFIN anticipates taking over responsibility after the next planned release of the zebrafish assembly, GRCz11. A specific timeline for this release has not yet been established, but is likely to be towards the end of 2016. ZFIN curators will continue training through 2016 with GRC curators on zebrafish genome issues. ZFIN will respond to potential problems in the assembly that are identified by researchers. Users can report issues on the assembly via the Report an Issue link at the GRC website. There are currently no plans to actively identity problems in the assembly. Once problems are brought to the attention of ZFIN GRC curators, updates will be issued as patches. The GRC welcomes your feedback on this update. Sequence improvements and increased variant representation in the human genome reference assembly are priorities for the GRC. This blog post describes two updates in the recent GRCh38.p7 patch release affecting the DUX4 region located at the chromosome 4q sub-telomere: (1) a FIX patch correcting the chromosomal representation (KQ983257.1) and (2) a NOVEL patch representing a variant of the region (KQ983258.1). A third haplotype of DUX4 region which is represented in GRCh37 will be also described. The DUX4 region contains tandem arrays of a 3.3 Kb D4Z4 macrosatellite repeat located in the sub-telomeric region of chromosome 4q. The number of D4Z4 repeats is highly polymorphic, ranging from 8 to 100 copies in the healthy individuals, but only 1 to 10 units in individuals with Facioscapulohumeral muscular dystrophy-1 (FSHD1: MIM#158900). The contraction of the repeat arrays is believed to result in a decreased epigenetic repression effect of D4Z4 and subsequent transcriptional activation of the DUX4 gene. Three main haplotypes, known as 4qA, 4qB and 4qA-L, have been reported for this region (1-3). 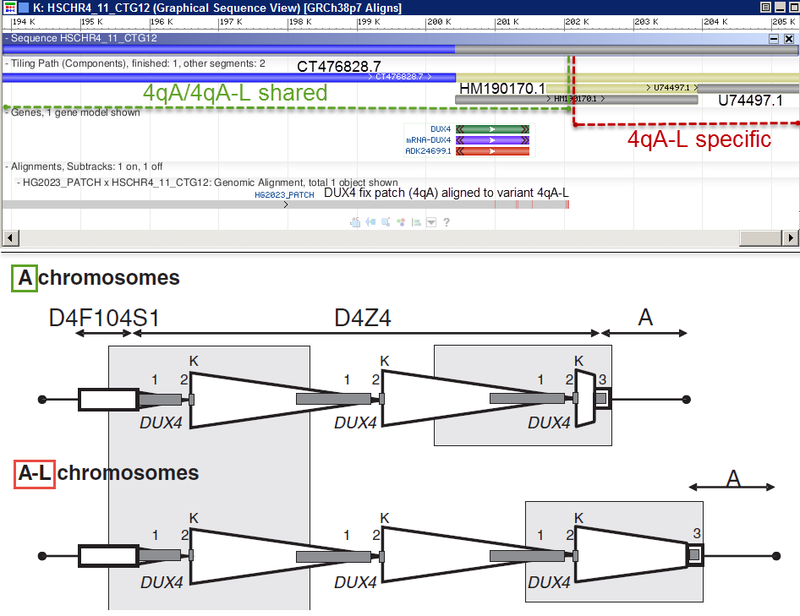 The 4qB haplotype has homology to 4qA in the D4Z4 repeats, but is completely different in the distal region (1,2). 4qA, considered the reference haplotype, is the ancestral and most common haplotype. 4qA and 4qA-L are associated with FSHD, while 4qB is not (2). The different haplotypes exhibit population stratification (3). 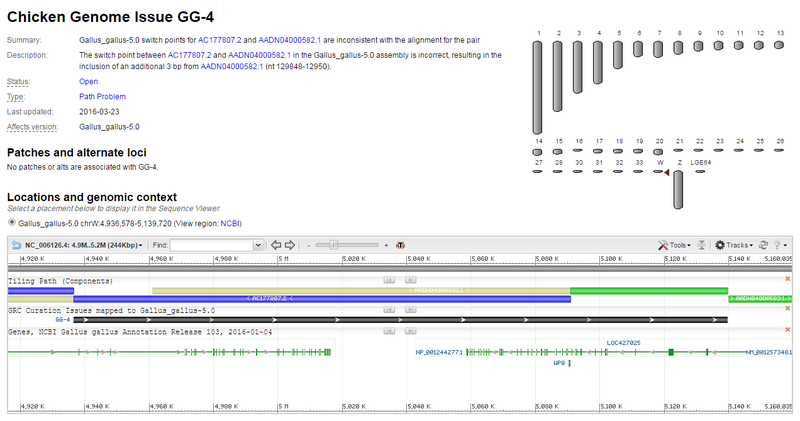 The GRC received user feedback that the DUX4 region is incorrectly represented on chromosome 4 of the GRCh38 assembly. The repeat structure in the region complicates both sequencing and assembly. Clones representing both the 4qA and 4qB haplotypes are present in GRCh38, creating a haplotype expansion and accompanying "false" gap at NC_000004.12: 190,123,122 bp, between components AC225782.3 (WI2-3035O22; 4qB) and AC215524.3 (ABC7-42391500H16; 4qA (partial)) (Figure 1, top). 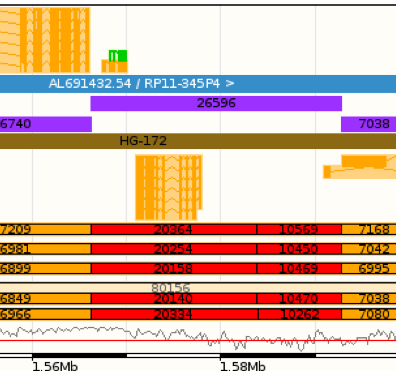 In the GRCh38.p7 fix patch scaffold KQ983257.1, the GRC provides a complete representation for the 4qA haplotype by replacing AC225782.3 with CT476828.7 (RP11-242C23) and eliminating the gap (Figure 1, bottom). The patch provides 14 copies of the DUX4 repeat. This fix patch representation for the region will be incorporated into chromosome 4 in the as yet unscheduled GRCh39 assembly release, and the 4qB representation currently present on the GRCh38 chromosome will be provided as an alternate loci scaffold. Figure 1 Top: DUX4 region in GRCh38. 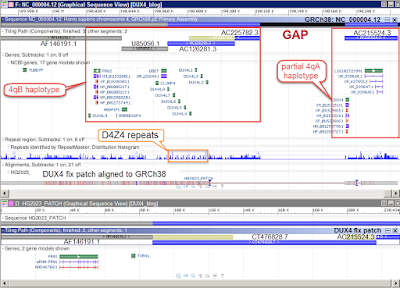 Incomplete representation of DUX4 gene in GRCh38 due to a mix haplotype representation of 4qB and partial 4qA. Bottom: DUX4 fix patch in GRCh38.p7. The gap is closed and a complete representation of the 4qA haplotype is provided. The GRCh38.p7 release also includes KQ983258.1 as novel patch scaffold providing representation for the variant 4qA-L haplotype. This variant is very similar to haplotype 4qA (Figure 2, top, green dashed line) but diverge in the distal-most DUX4 copy (Figure 2, top, red dashed line) which is about 1.6 Kb larger in 4qA-L (Figure 2, bottom). The functional implication of this difference is not yet known. Figure 2 Top: Novel patch representing DUX4 variant 4qA-L. 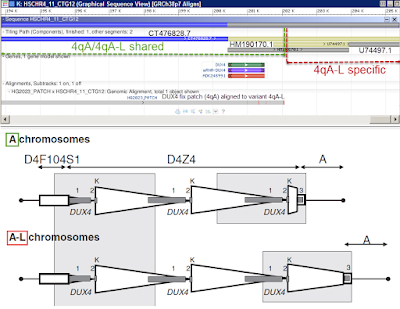 This variant is similar to haplotype 4qA but the region distal to last D4Z4 unit is longer in 4qA-L. Bottom: Schematic of D4Z4 repeat arrays for 4qA and 4qA-L regions, adapted from Lemmers et al., 2010. 2. Lemmers, RJLF. et al. Nature Genetics 32, 235-236 (2002). 3. Lemmers, RJLF. et al. Science 329, 1650-1653 (2010). Commercial whole genome mapping systems, such as OpGen and BioNano, are playing an increasingly important role in a variety of genomic analyses, including de novo assembly, structural variant detection and assembly curation. Comparison of a reference assembly to a collection of whole genome maps can help curators find potential regions of misassembly and identify genomic variations that are candidates for representation in alternate loci scaffolds. For example, optical maps played a key role in the GRC's resolution of the human 10q11.22 tiling path, as described in this prior GRC blog post. Below is an example highlighting the potential usage. 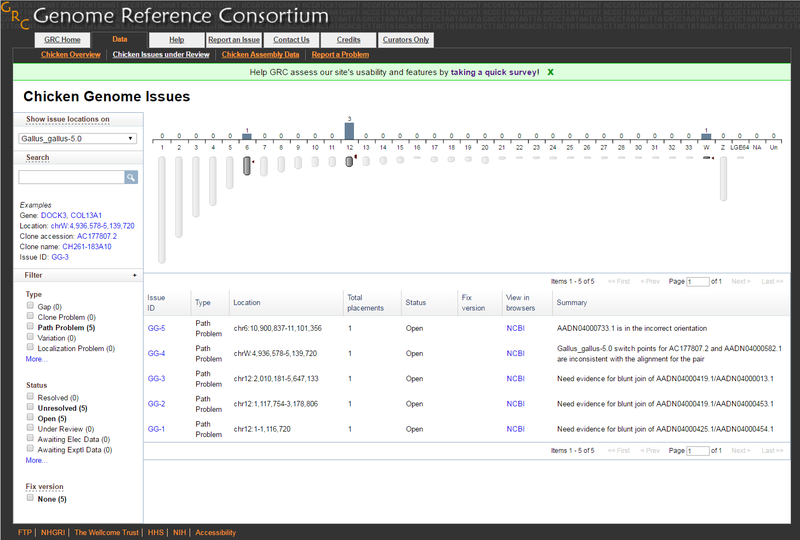 In the REFSEQ track there are 4 distinct transcript mapping groups, in which most are orange colour indicating the mapping is incomplete in terms of coverage. This indicates that perhaps there may be an issue in the assembly. From left to right the first group is mib2, mm23A/B, cdc2L1(cdk11b) and slc35e2. Zooming into the region of the red features in the Bionano genome maps reveals clearly the fragment sizes between Bionano BspQI nicks/labels. The red features within each map indicates a discordance in size with the BspQI insilico digest. The insilico digest reveals that the region in question on the assembly has a fragment size of ~26,5kb, whereas all 5 genome maps reveal two fragments totaling ~30kb. This discordant region encompasses the cdc2L1 gene (which from further analysis indicates 2 exons missing) as well, giving evidence that perhaps this region is not represented correctly and missing roughly 3-4kb of sequence. Upon further review and analysis, the GRC curation team was able to place in to motion new clone sequence to represent correctly this region. The new path is represented in GRCh38 below. The addition of clone FO704657 on to the assembly path correctly contains the complete coding region for the cdc2L1(cdk11b) gene. It also corrects the flanking gene mappings as well. 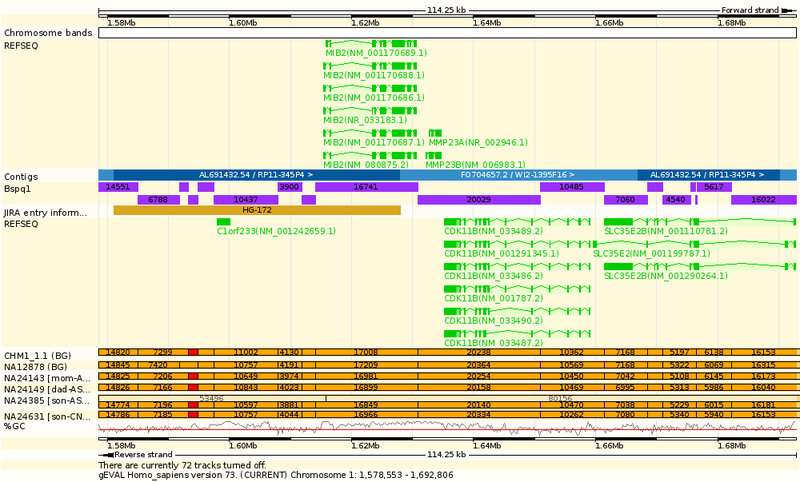 This is indicated by the green mappings of the REFSEQ transcripts. The discordant red features of the Bionano genome maps are no long present, replaced with concordant fragment mappings. The issue can be updated as resolved. For more information on how to use BioNano displays in gEVAL, check out the gEVAL browser blog.